We picked up two beautiful 6 oz Salmon filets tonight at the store and made a recipe Gabe's Dad has mastered over and over again. Place salmon filets in a resealable plastic bag. Combine marinade ingredients in a non-reactive bowl or measuring cup. Pour marinade over filets, vacuum seal and refrigerate from 1 to 24 hours. Preheat your cast iron skillet and grapeseed oil. Place marinaded Salmon in the pan, flipping after 2 to 3 minutes and cook for another 1 to 3 minutes, or until desired doneness. Place your red pepper in a small saucepan with Mirin. Sautee for 3 minutes. Add the remaining ingredients, simmer for 5 minutes and set aside until you are ready to serve with the salmon. YUM!!! 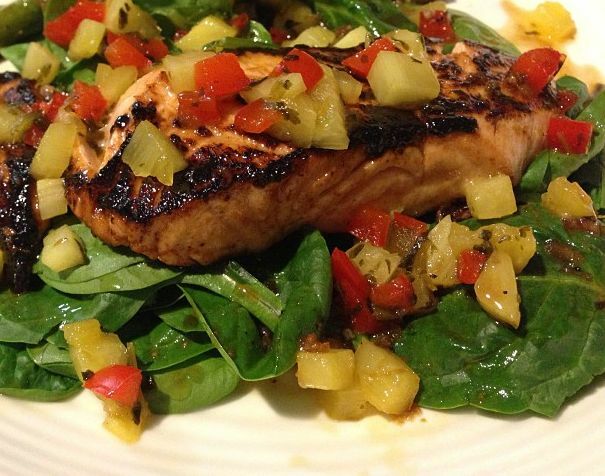 I'm glad you're flexing your fish cooking muscles..I tend to think I cook a better fish filet than chicken breast! So easy when you get the hang of it...LOVE salmon and it looks like you cooked these filets flawlessly. Also loving the pineapple salsa- a favorite topping of mine for seafood :) Great post with great photos. Yay for paleo!!! Mmm - it's such a colorful plate! I too am nervous when it comes to trying new meat/fish/etc. 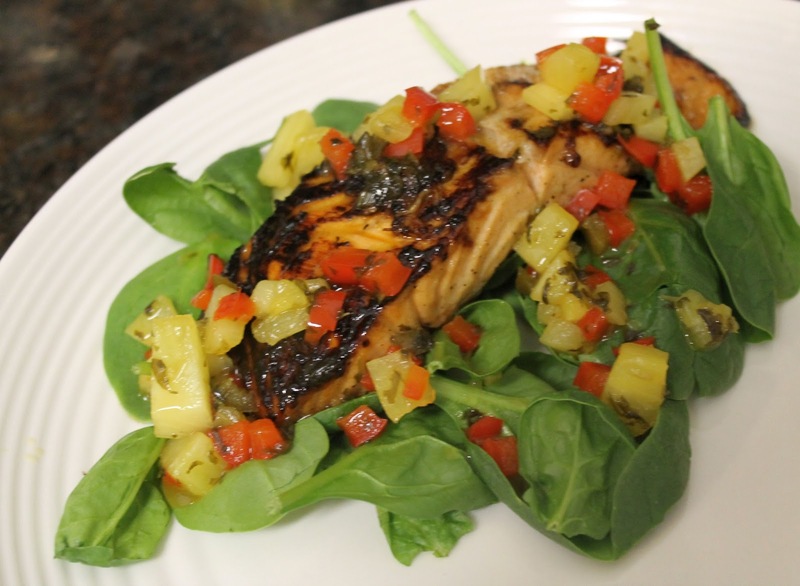 - I've got tilapia and mahi down to a science, but haven't tried my hand at salmon yet either!